Apple today began shipping the 18-core iMac Pro to customers in the United States, just over six weeks after it began accepting orders. The first orders are estimated for delivery starting Tuesday, February 6. 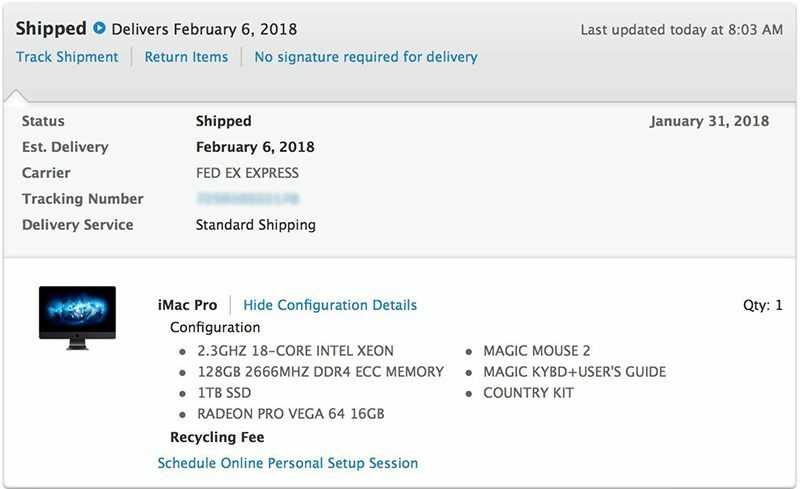 MacRumors readers Anthony Berenato and Steve McKinnon both alerted us of the shipped status of their orders, while a few other Apple customers have echoed the same in the iMac Pro order topic in our discussion forums. 18-core iMac Pro configurations start at $7,399 in the United States, and with fully maxed out tech specs, the powerful workstation costs up to $13,199. Apple quoted a shipping estimate of 6-8 weeks for the 18-core iMac Pro, pushing most deliveries into early February, so it is ever so slightly ahead of its schedule. We haven't confirmed if 14-core models have shipped yet. iMac Pro is also available in 8-core and 10-core configurations, priced from $4,999, and those models began shipping in late December. Micro Center is offering an impressive $1,000 off the base model while supplies last. Last month, some customers were quoted an updated delivery timeframe of early January for 18-core iMac Pro orders, but in a follow-up email, Apple said this was an error. This time, the first orders have actually shipped out. 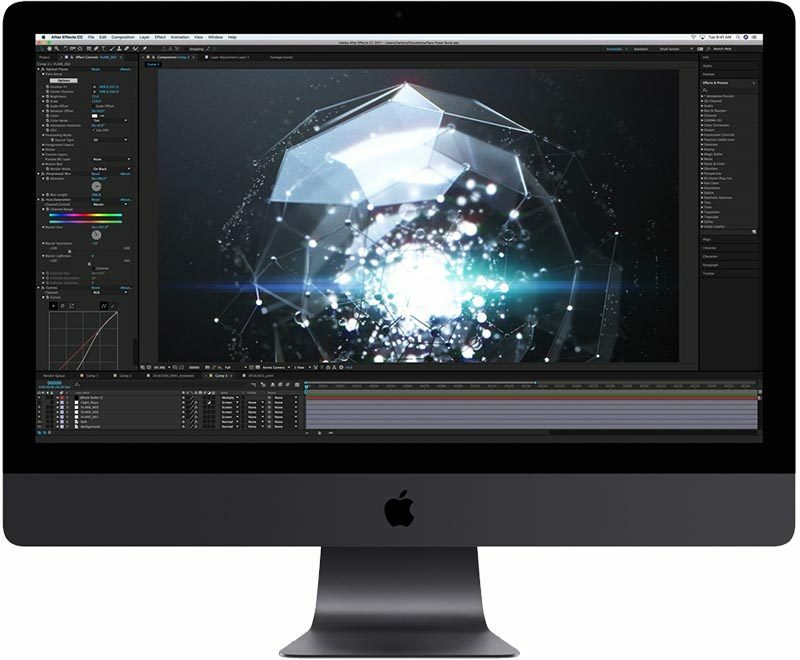 iMac Pro is a powerful, top-of-the-line workstation designed for professional users with demanding workflows, such as advanced video and graphics editing, virtual reality content creation, and real-time 3D rendering. The machine can be configured with up to an 18-core Intel Xeon processor, up to 4TB of SSD storage, up to 128GB of ECC RAM, and an AMD Radeon Pro Vega 64 graphics processor with 16GB of HBM2 memory. May the thermal paste be with you. Thank God. My email and Twitter work desperately need 18-core multithreading. My 2010 eight core Mac Pro will heat an entire room while rendering 3D stuff overnight- running full bore all cores continuously. I can only image what the temperatures are going to be inside that cramped, confined little iMac case when 18 cores are switched to full bore when the Render button is pushed. I can't even imagine what having 18 cores is like. I'd have an external monitor dedicated exclusively to Activity Monitor. Congratulations. That is one powerfully beautiful machine you will be receiving. Sure, for 56,000$. I could get five of my iMac Pros for that cost. No thanks. Thanks for that, but I wasn't really answering you, you do what ever you like with your money, it's your cash and I'm no preacher. I was however quoting the fella that wondered what 18 cores could do, not as much as 56 cores I would wager. Anyway, none of this is your fault, Macs just are sooooooo behind the curve with their "pro" level machines it's not funny. The rest of us are still having to wait for something that's not glued together. Not that the iMac is for people who want to upgrade as time passes; for example, who would want to be able to upgrade their RAM themselves, right? But listen, clearly you’re excited and you think you've done the right thing with your money – and good luck to you mate! It's just not what a lot of us are looking for, or would invest in. Come on Apple! Tick tock. Mine should arrive shortly. All maxed out.